“MIEN SHAING” or Chinese face mapping. This literally means face reading. 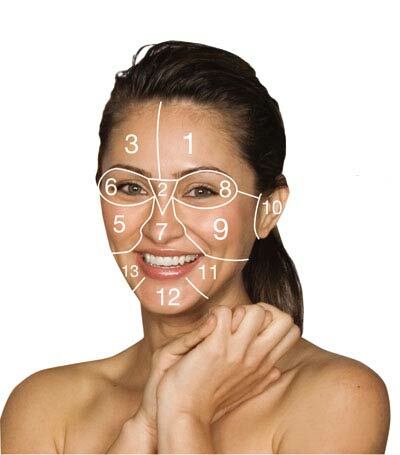 Chinese traditional medicine firmly believes that the Chinese face mapping tells more about our body than we think. Every part of our face represents particular organ in our body. When problems arise in certain areas, for example the chin, it shows us that we have other health problems that should be solved – Chinese medicine claims. The Chinese face mapping tell us about the imbalance of skin – for acne, rashes, skin sensitivity, inflammation, redness, wrinkles and pigmentation. Cause: Too much salt intake, lack of water and too much spice and caffeine intake can affect this area. Solution: Drink more water and reduce caffeine, salt and spice intake. Cause: Food that is very greasy and caloric lead to lazy bowels and stressed out digestive system. Also, going to bed late, excessive consumption of alcohol and sugar will prevent proper digestion and cause chaos when it comes to maintaining your skin’s health. Dirty hats, too many hair care products and stress can also cause these problems. Solution: Drink plenty of clean and pure water, eat organic and raw food, avoid drinking alcohol and get plenty of sleep and rest. Cause: You are probably allergic to certain foods, such as wheat or meat. It can also indicate that your digestive system works too much and not getting enough rest. Solution: When it comes to improving this kind of health state, the following things are recommended: fresh air, tranquility, healthy and fresh foods, exercise (such as yoga), brisk walking and meditation. Cause: Excessive alcohol and cigarette consumption. Solution: Avoid alcohol, caffeine and sweetened drinks. Drink lots of clean water. Frequently check if you are sufficiently hydrated. Cause: Bloating, constipation, indigestion, gas, and poor circulation. Also, high blood pressure can cause problems in this area of your face. Solution: Check your blood pressure in order to be sure within the acceptable. Organic green tea will help to remove toxins, but also moderate daily exercise will improve this health condition. Cause: Asthma, smoking, pollution, all this will affect this area. Also, this is the area where dark circles might occur. Solution: Make sure you are away from polluted air, smoke, smog, etc. Be sure to increase the intake of oxygen. If you smoke, you need to quit smoking. Physical activity in the fresh air is also highly recommended. Remember to also stay away from spicy and oily food. Cause: Stress, unhealthy diet, stomach problems, indigestion, smoking, too much sugar, possible allergies. Solution: You will need to eliminate certain foods from your diet and to make sure you use quality natural cosmetics, suitable for your skin. Materials, such as pillowcases and mobile phones may also be the cause of this health state. Make sure the area is clean. Cause: A diet rich with sugar, fat and stimulants, such as alcohol and caffeine. This area is most affected by seasonal food. Sitting up late at night and stress can also lead to hormonal imbalance. Solution: Detox diet will help you clean your body and maintain balance. Eat plenty of dark green vegetables and drink large quantities of water. If the problems continue, consult your doctor. Cause: This may mean your body is fighting bacteria, stress and lifestyle or diet changes. Solution: Spend your time in areas with fresh air and exercise. Yoga and meditation will also help.